Are the calories in pani puri a boon or a bane? Nobody can say no to pani puri or paani poori or gol gappa. This delicious & tangy feast is undoubtedly on the top of everyone’s favourite food list. Is pani puri good for weight reduction? Well, if you are a calorie counter, then we have good news for you. Pani puri is useful for weight reduction (if consumed responsibly). Therefore, you can enjoy them without giving it a second thought. Let us tell you how. Can we eat pani puri while we are on a weight loss regime? Yes, of course, you can enjoy pani puri once in a while to satisfy your cravings. But there are some basic rules which should not be forgotten while indulging them when you are on a strict diet. We suggest you improvise on it so that you enjoy your guilty pleasure while you simultaneously follow your diet. 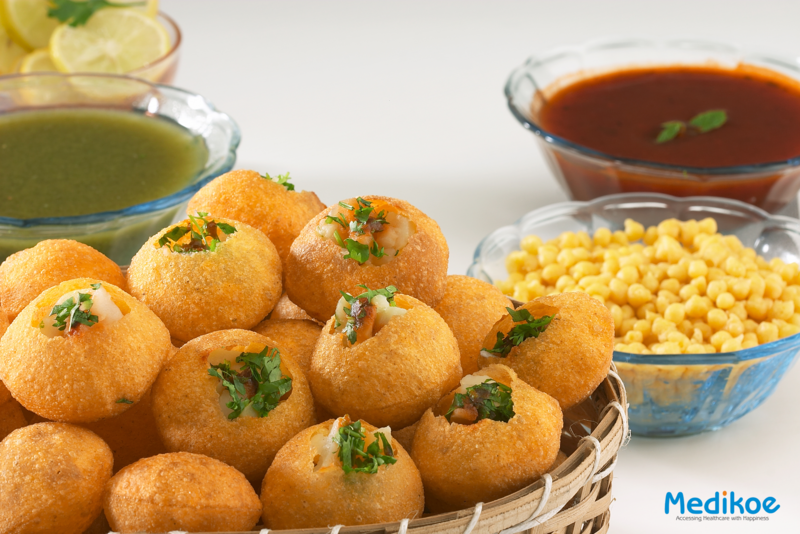 You can pick an altered pani puri, for example – you can avoid deep-fried suzi puri, sweetened chutney & potato stuffing. Instead, you can have wheat pani puri that will help you cut down the poori calories (or puri calories). Nonetheless, have them in limited quantity & make the most of your pani puri day yet with few cautions mentioned below. A plate of pani puri (6 pieces) contains 475 calories, therefore, make sure you enjoy every bite of it since over-indulgence can have an adverse effect on your diet plan. Remember, balance is the key here! Like a few food items, this one also accompanies a notice sign. In case you want to satisfy your pani puri cravings, have a plate full in the afternoon. The high salt substance in the salty water of pani puris can bring about water retention. Abstain from having them at night as it might hamper with your numbers on the measuring scale keeping the calories in pani puri in mind. Unquestionably don&apos;t eat them as a pre or post-exercise nibble. Shift to wheat puris or sev puris since the calories in sev puri and wheat puri is way lesser than the calories in suji puris. Do not eat suji or suzi puris at any cost. Refrain yourself from consuming too much potato stuffing & sweet chutney with the pani puris (this will help you in decreasing a couple more calories). Try chanas instead of potatoes. Also, search for a seller who gives you moong or chana based stuffings. It might be costlier, but it’s worth it when it comes to your health. How many pani puris can I eat while following a weight loss diet? You can have six small gol gappas as a feast for lunchtime. Once your longings for gol gappas are fulfilled, try to have a saltless meal at night, followed by a bowl of papaya & an apple with low-fat milk. This helps with your water retention. Go on & make the most of your cheat day but make a point to run this little tryst by your dietician once. In case you are delicate to gluten or gluten-free food then you cannot have pani puri. People with hypertension are also suggested to stay far far away from any chaat items because of the measure of salt present in it. In any case, you can make your pani puri at home by substituting amchur for salt! What are the constituents of a weight loss pani puri? Lastly, keep in mind to make the most of your guilty pleasure (depending on your calorie percent daily) by taking time and enjoying every bite you take!